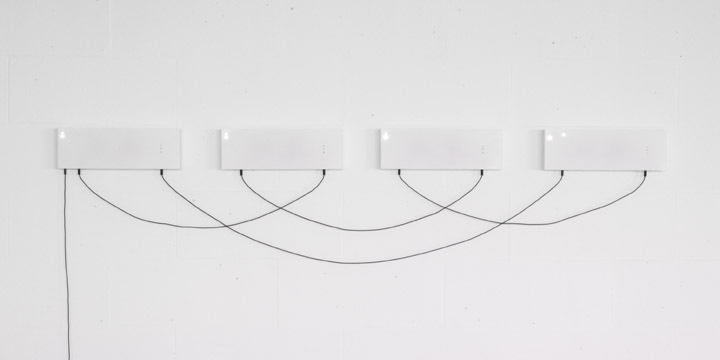 Cablogramma (cablegram in italian) is a networked installation composed by four equal modules connected in cascade, any devices contain a microcontroller driving a piezo speaker and three white leds. The system is designed for autonomously generating simple variations emerging by a software - based on a cellular automaton - distributed on the four devices. 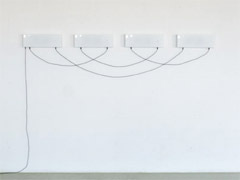 Each modules is a voice capable of simple real time synthesis as well as communicating with other devices (through serial communication). The audio result is an evolving pattern sounding in the between of alarm signals and a micro-spatialized a quattro voci counterpoint. Alessandro Capozzo , "Cablogramma", 2008.Modular installation. Software, polished acrylic, microcontrollers, piezo speaker, leds, cables and various electronics.